This morning, US President Donald Trump and First Lady Melania Trump will be respectively at a meeting of NATO in Brussels and at a museum in Tervuren with the other first ladies. For the past two days, no major scale protests could be seen in Brussels where all 28 heads of state of the member states of NATO are treated respectfully. Quite different will be the scene this afternoon when the US First Couple heads over to London, capital of the United Kingdom. Some 50,000 of them are expected to gather so they can show how much they dislike the US President, normally one of the ‘greatest allies’ to the UK. Conservative voice Mr Piers Morgan debated one of the young protest march organizers, Miss Ash Sarkar, on Good Morning Britain, asking her: “Did you find Obama deporting 3 million people unconscionable?” to which she responded ‘yes. 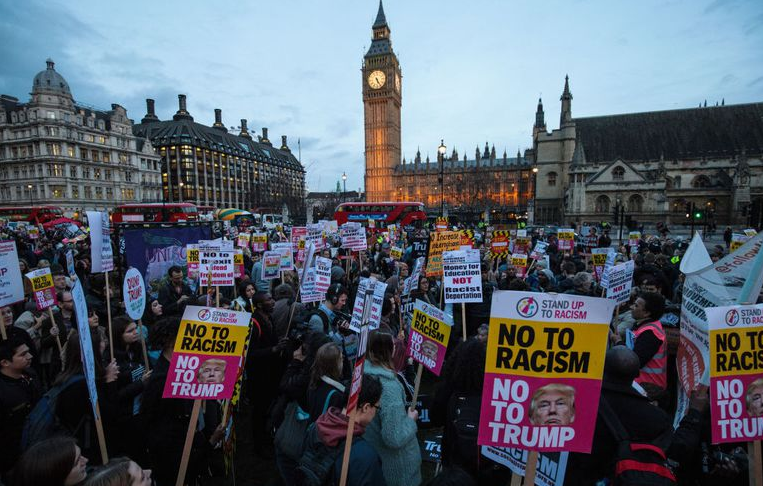 Many in Britain feel the level of organized protest against the US First Couple’s visit is harmful to international relations, certainly given the fact that Mr Trump will be steered away from the protests whilst the visit to a children’s hospital by Ms Melania Trump will be greeted by many protesters, mostly aimed against her husband. A spokeswoman for FLOTUS confirmed: “On Friday she is going to have a separate programme in London and because it is in London I am not able to share the location. Obama didn't deport the illegals he had them bused to sanctuary cities. Seems a bit too organized. Were the Brits helped by a US community organizer? Like Barry Soetoro? Trump was never called a racist or bigot prior to running for President. The media are liars. Ah, the bleeding heart libtards who can't even protest their own because that would be diluting their political power.